In honor of a brand new season, I’m introducing a few new series to the blog! The first of these is the Monthly Mood series, a compilation of things I’m loving, what I’m reading and listening to, what I’m excited for, etc. at the beginning of each new month. I’ve loved putting together a fun little to-do list each month for my mailing list, and this blog series is my way of expanding on that. Plus, I love any excuse to create more cute illustrations :) If you’d like access to the monthly to-do list, be sure to sign up for the mailing list below! 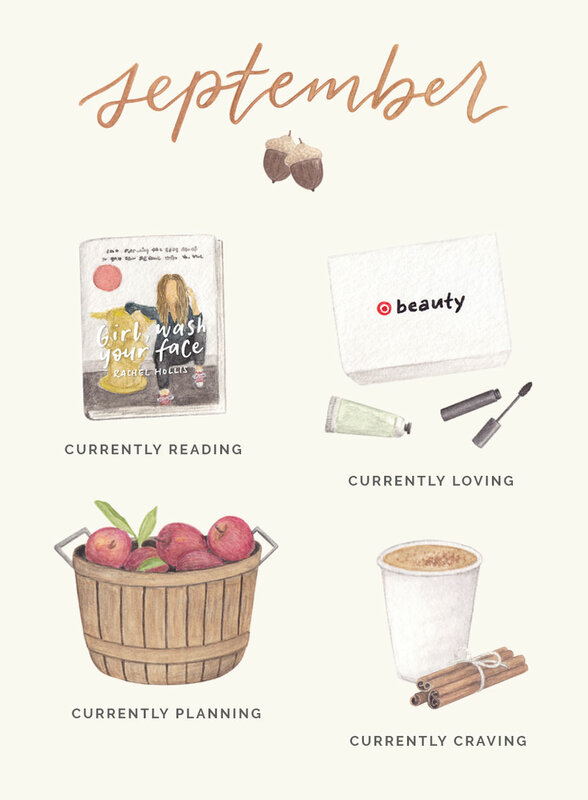 And without further ado — here’s what I’m loving for September! I’m all about warm, cozy colors as soon as September rolls around — even if fall doesn't officially start until the 22nd! This month’s color palette was inspired by some of my favorite fall treats AND the earthy-yet-vibrant tones that come with the change in season. I can’t quite remember how I found out about Rachel Hollis and her latest book, but I am SO glad that I did! Girl Wash Your Face is hilarious, heartfelt, and truly a kick in the pants for me to start reframing the way I think about who and how I am as a woman/human. I highly recommend it, and can’t wait for her next book, Girl, Stop Apologizing! I started ordering the monthly Target Beauty Box a couple months ago, and I am officially obsessed!! I know there are tons of awesome subscription and beauty boxes out there, but here are a few things I love about this one in particular: (1) it’s SUPER affordable — just $7 a month, plus free shipping, (2) there’s a mix of sample sizes and full-sized products, and (3) if you find something you love, you can usually get 15% off box items later that month! A trip to an apple orchard! My hometown is surround by farms and orchards where you can pick your own fruits and vegetables, and now I love finding places like that in the Denver area. I’m thinking we’ll head to the Ya Ya Farm & Orchard — in addition to apple-picking, they offer up fresh apple cider and donuts, too! What are you looking forward to this month?? Leave a comment below to share your fall faves! *Some of the links in this post are affiliate links, which allow me to earn a small commission by linking to certain products. I only share products that I truly love and believe in — participation in affiliate programs does not influence my decision to share products with you.